Delonix regia is a species of flowering plant in the family Fabaceae, subfamily Caesalpinioideae. It is noted for its fern-like leaves and flamboyant display of flowers. In many tropical parts of the world it is grown as an ornamental tree and in English it is given the name Royal Poinciana or Flamboyant. It is also one of several trees known as Flame tree. Gulmohar tree is regarded as one of the most beautiful tropical trees in the world. The tree grows to a height of about 20-25 feet usually but can and does many times reach a height of 50 feet. The tree is an evergreen deciduous with the branches spreading wide and forming an umbrella like canopy. It remains green throughout the year wherever there is enough water. However, in areas in which it does not have access to water in the dry season or during times of drought it sheds its leaves. The gulmohar grows well in the tropical and subtropical areas of the world. It prefers the sun and does not like shade and doesn't grow well in shaded areas. It is native to Madagascar but it under threat in the wild there because of habitat destruction. It has become naturalized in Southern Florida in the U.S. It is invasive in parts of Australia competing with natural vegetation. The tree commonly bears red, crimson, orange and to a lesser extent the rarer yellow colored flowers. The Gulmohur tree competes with other nearby vegetation and therefore the ground under its canopy remains bare. The tree starts bearing flowers after 4 to 5 but there are instances of trees flowering after 12 years or more. 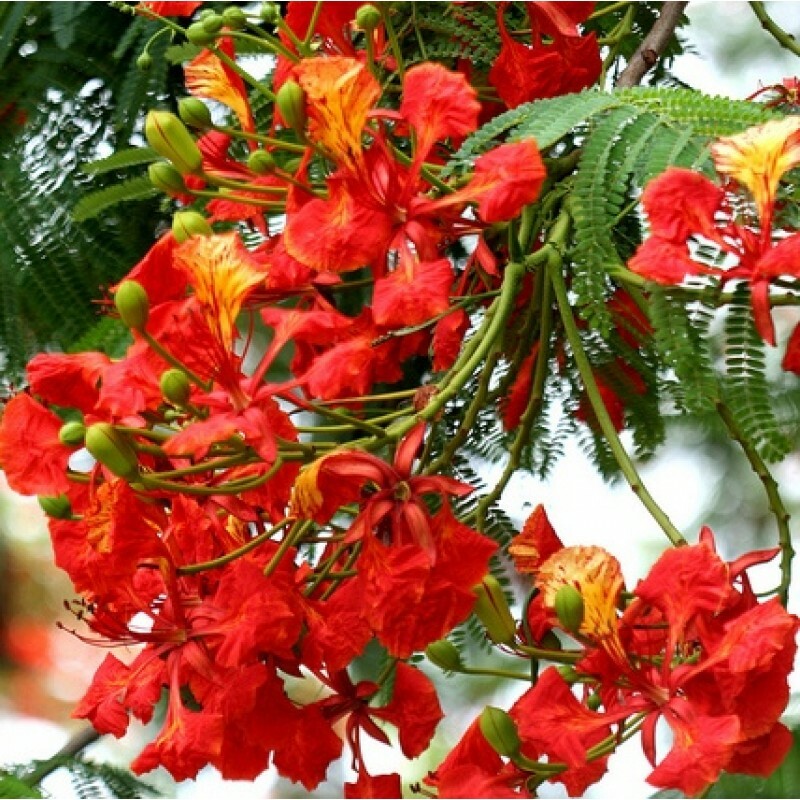 Delonix regia can tolerate salty conditions also and can be grown in coastal areas. It is widely cultivated as a ornamental tree in parks and on the roadside. It provides valuable shade during the summer season. The wood is durable and resistant to water and is used to make fence posts. The seeds are used as beads to make necklaces, bracelets and other artificial jewellery. The gum from the dried seeds is used as a binder in the manufacture of tablets like paracetamol etc. The bark is believed to be antipyretic. The inner portion of the seed is eaten in Thailand.